Despite stereotypes indicating the contrary, research shows that women are safer drivers than men. Men get in twice as many fatal crashes as women and are more likely to drink and drive. Which explains why women benefit from lower car insurance premiums. For female drivers who want to guarantee safety and no restrictions on where they can go when they’re behind the wheel, a Jeep is often the vehicle of choice. An American heritage brand with a loyal following, Jeep’s utility vehicles has come to define their class. After all, cruising through the city is great, but Jeeps and off-roading is a match made in heaven. And, as any Jeep-driving woman knows, getting off the beaten path in a Jeep is a feeling of freedom rivaled by few experiences in life. 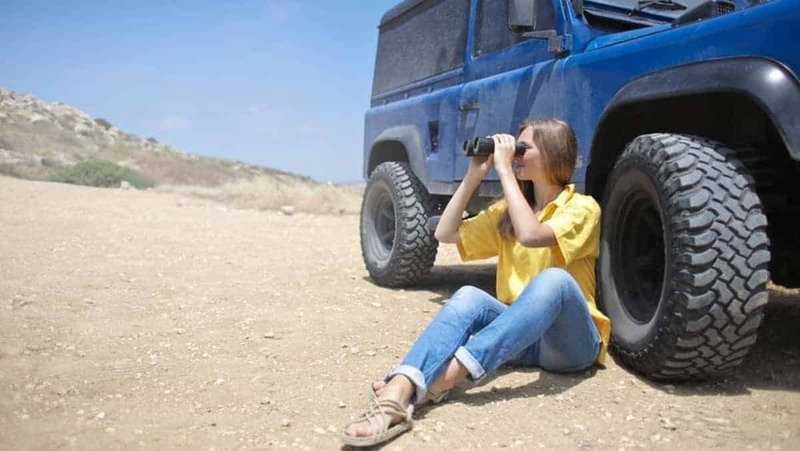 If you’re looking for a new off-road vehicle, read on for our guide on the best Jeeps for girls. A firm favorite and one of the best Jeeps around is the Grand Cherokee, with the Trailhawk model offering the pinnacle in off-road spec. An adjustable air suspension provides all the lift, while 30.5″ all-season tires ensure you’ll be able to tackle any terrain. Inside, the leather and suede trim keeps things stylish, and the large touchscreen display offers info on the performance, suspension, and pitch. Underneath, you’ll find skid plates covering the transfer case, front suspension and underbody protecting the vital components that make for a powerful ride every time. If you’re heading off for a solo camping trip and want to look the part, the Jeep Wrangler is one of the best off-road jeeps to take on your next adventure. With a dual-vented hood, upgraded Dana 44 axles, 32-inch tires, the Rubicon Recon special edition is equipped and ready for a ride into the wilderness. This Jeep also comes with heavy-duty cast covers and model-specific rock rails for added protection against rocky trails. And then there’s the electronic sway bar disconnect switch, which allows for optimum wheel articulation while off-roading. From cool features to a massive approach angle, the Rubicon Recon has it all thought out for a smooth ride and little chance of getting stuck anywhere, ever. Combining rugged features and iconic styling, the Jeep Patriot is a good choice for drivers who love the Jeep aesthetic but want something more compact. And, thanks to the way it ups the ante in terms of standard features and optional extras, the Latitude model is one of the best Jeeps for women. Despite being a compact, modest SUV, the Patriot Latitude can hold its own when off-roading, while it provides a more luxurious road experience than more rugged Jeep models, such as the Wrangler. And its affordable price point makes it superior to any other comparable compact SUVs. If you love the Jeep Grand Cherokee but don’t need such a big SUV, the Jeep Cherokee Trailhawk is a smaller alternative that’s just as solid. Built for adventure and ready to roll, the rugged Cherokee is great for getting you to some seriously isolated destinations. Just remember to pack these essential survival items to make sure your outdoor adventures go as smoothly as your ride. As one of the best Jeeps for women with an adventurous side, it includes skid plates, tow hooks and other features for trail-tracking fun. Plus, this model comes with a 271-HP V6 for plenty of power, as well as secure storage thanks to the Jeep Cargo Management System. While it seems they’ve thought of everything, if you need great gift ideas for women who have Jeeps, check out this website for inspiration. If you’re searching for a Jeep on a budget or a small crossover, then the Renegade Sport is the one for you. The Renegade Sport is a good subcompact SUV with a range of modern features and the off-road abilities you’d expect from a Jeep. Daily city-friendly driving is a breeze too, and cool amenities like a rear-view camera, Bluetooth and a touch screen are standard from 2018 onward. Although some rivals might be more fuel-efficient, few can compete with the Renegade’s off-road prowess, user-friendly tech features, and stylish interior. For some, the sleek style of the Cherokee Sport might seem to deny its Jeep heritage. But fans of this model see it as the company embracing a more forward-facing perspective. This Cherokee comes with a strong V6 engine option, an absorbent suspension and interior tech features such as a touch screen. And, while this model is right at home in the city, it offers a unique off-road capability for a small and sporty crossover. And, for those family trips into the wilderness, the Jeep Cargo Management System comes as standard to help you tie down everything you might ever need. If you’re in the market for an affordable compact SUV with an upscale interior and more than its fair share of terrain-tackling ability, the Compass is a good bet. That said, this model isn’t without its negatives. It lacks a little in cargo space and its nine-speed automatic transmission can be slow to accelerate. But the Jeep Compass more than makes up for these cons with good fuel economy estimates, one of the lowest MSRPs in its class, a great infotainment system and the off-road power you’d expect from a Jeep. As this range of Jeeps for girls shows, finding your perfect Jeep has never been easier with such a high standard across all models and specs. From sleek and sporty numbers to rugged machines, Jeeps appeal to women who don’t want to limit their driving to the daily grind of the city. Of course, if you’re in the market for a new Jeep, you’ll also need to plan an adventurous road trip to put your new baby to the test. But, whether you head for the West Coast or opt for a hiking trip to Lake Tahoe, you can be sure that your new Jeep will be ready to go wherever you go.